An enchanting treasury of familiar old children’s and folk songs. Soprano Jeanette Roeck and her brother, the jazz pianist Jan Roeck, take up the musical legacy of their childhood and make some lively music together. A collection of songs suitable for dancing, playing and singing. It’s music you can listen and hum to, and even join in. An indispensable companion for all adults and children who’d like to sing and get acquainted with a lasting cultural tradition. Born in Bad Saulgau/Germany, soprano Jeanette Roeck studied voice in South Tyrol and in Italy, where she took degrees in solo singing as well as in lied and oratorio. She continued her vocal studies in Vienna with Hilde Zadek, Janina Baechle, and also studied acting with Dunja Tot. Since her debut in 2005 in “the Goldener Saal” of the Vienna Musikverein, she has participated in concerts and lied recitals throughout Europe, including Germany, Italy, Croatia, Austria, Spain, Portugal, and Turkey, performing works of a wide variety of musical styles. Jeanette Roeck has sung with renowned conductors such as Leopold Hager and Philipp Auguin and has performed as soloist with numerous orchestras, including the Zagreb Philharmonic Orchestra, the RTVE Symphony Orchestra in Madrid, the Orquestra Sinfónica do Porto Casa da Música, the Slovak Philharmonic, the Istanbul State Symphony Orchestra, the Haydn Orchestra of Bolzano and Trento, and the Baden-Baden Philharmonic Orchestra. Her opera and operetta repertoire includes major lyrical soprano roles such as Pamina (The Magic Flute), Marie (The Bartered Bride), Liù (Turandot), and Angèle (Lehár’s The Count of Luxembourg). Her concert and lied repertoire encompasses a wide range from Bach and Mozart to Alban Berg and Gottfried von Einem. Since 2006 Jeanette Roeck has taught voice and musical theatre at the music schools in Vienna, St.Pölten and in Lower Austria and gives numerous master classes in Austria and abroad. With her brother Jan Roeck, an outstanding jazz pianist and versatile accompanist, she recorded the present CD of children’s and folk songs – a stimulating encounter between classical singing and jazz piano that will delight and inspire children and their parents who have remained young at heart. Hailing originally from Bad Saulgau/Germany, pianist Jan Roeck currently resides in Munich. He is music director and répétiteur at the Badisches Staatstheater Karlsruhe as well as at the Altes Schauspielhaus and Komödie im Marquardt in Stuttgart, where he has been heard in productions that include Heesters, Edith Piaf and Meisterklasse. A much sought-after classical and jazz accompanist, he collaborates with a wide variety of ensembles and soloists. He is a visiting lecturer of vocal coaching and improvisation with Musica Viva and gives numerous master classes in Germany and abroad. With the singer and actress Asita Djavadi, he has composed several children’s musicals such as Jule Rapunzel, Rumpelstiltskin’s Luck, and Little Red Riding Hood’s Wolf. Additional highlights have been the dramatic stagings of Piaf – the Search for Love and Piaf meets Brel, both of which have met with much success in performances throughout Germany, including an appearance at the Berlin Philharmonie. For over ten years Jan Roeck has been the regular accompanist of Annette Postel. Together with the Munich Philharmonic String Quartet they celebrated the premiere in the spring of 2012 of the musical performance piece Champus Violett. In 2017 Jan Roeck and Asita Djavadi released a new CD entitled Fragile – the Best of Everything. 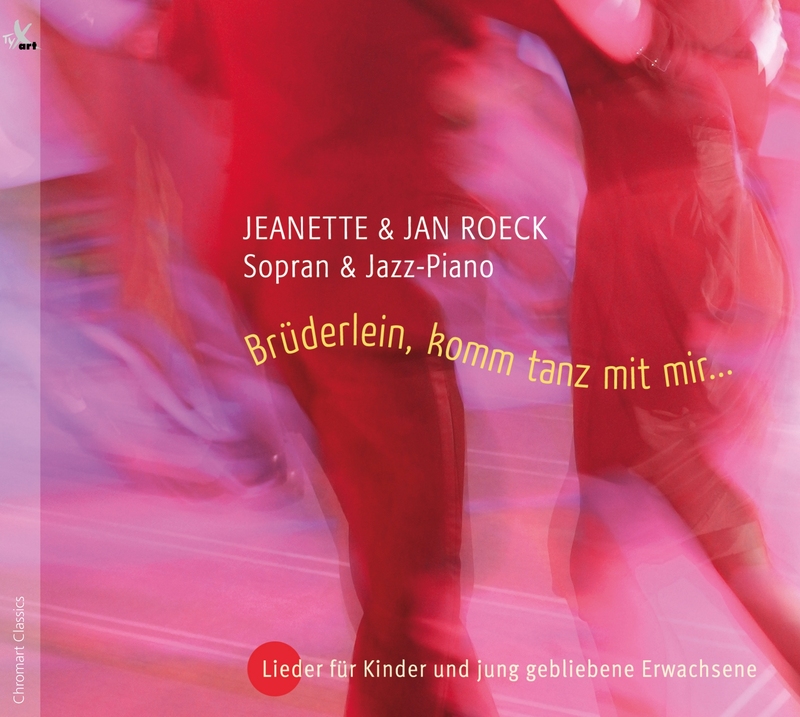 With his sister Jeanette Roeck Jan Roeck recorded this album of children’s songs – an exciting encounter between classical singing and jazz piano that will bring pleasure to both children and parents who might still be young at heart. Free audio samples of this new CD album! Conzert with CD Presentation — Recommendation! Further CDs in the Series Chromart Classics coming soon.